I have my Emby Server running on a RPi 3B and I would like to try to connect to it externally out of my network. Our speed is 15 Down and 4 Up. I am doing some testing with the RPi before I get better hardware so I want to know if this would work. I tried following the steps that it shows here https://github.com/M...ki/Connectivity but no luck. Hi, which steps in the troubleshooter succeeded and which ones did not? Well, I am able to get my external IP address from Emby which is running on a RPi with Ubuntu Mate, as you know, which is good. I try to setup a static IP, but it seems not to work in Ubuntu Mate. I am able to access the Emby Server locally with the internal IP Address. The RPi is connect via ethernet so I don't think it should be a problem whether or not it is static or not only because I've unplugged it and replugged it back in and it always kept the same IP. I setup port forwarding on my router, and it seems to be straight forward from the page linked above, but when I go connect, noting happens. I try on safari on my iPhone to connect to the external IP with the port and it times out, I also tried Emby Connect as well as just logging in within the app. No luck. And your certain you have the correct remote address? The remote address I have is what is shown on the Emby Server. It shows it right under the local address. And you're sure that's the correct value? Yes, what other value could it be? Your ISP for example could be using Carrier-grade NAT. You could be using a double NAT in your own network. You could be running through a VPN. Lots of reasons you may not have a true eternal IP. If you go to https://www.whatismyip.com/ from the Emby server machine, do you get the same IP on that website that Emby Console shows you? Edited by cayars, 20 March 2019 - 10:06 AM. I see. There is a NAT toggle button in my router settings which is on. I will have to check to see if that IP is the same on Emby. But, from what I remember, it looks pretty identical. One set of NAT is perfectly fine and we (generally speaking) all use NAT on our networks (we have private IPs internally and use 1 external IP for the whole house). So don't mess with that unless you know what you're doing! It's only when there are TWO or more sets of NAT involved that things get tricky. Examples of this could be when an ISP doesn't want users to run servers so they deny them a true rout-able IP address. Another common way two NATs happen is when you use both an ISP provided modem/router and then your own router/wifi unit both set to use NAT. VPN anywhere in the server path will also change the external IP. Once you run that test from your server machine will know if any of this is happening or if you are in the clear and we can take it from there. Yes, I won’t mess with anything to do with my NATs. There is only one on my router. Also, I have a modem from my ISP that we got that is a Model/Router Combo, but I am just using my own router and using the modem as just a normal modem from my ISP. Does it matter what type of modem it is? I’m hoping that my ISP is not blocking my connection. What’s the way around this? I do not have a VPN. I will verify my server has the same External IP with that site or not and check back in with you. You may very well have a double NAT situation if you didn't setup things in bridge mode. Let's see what you test comes back with. If needed I can privately help you sort this out via TeamViewer session but lets see what is determined by the IP test. Let’s just see what the IP comes back first. I’m very private about my network. Do you want some personalized help so you don't need to post network info publicly here to go further in figuring this out? If so shoot me a PM. I think we can do it here, I just won't publish anything personal. I just need help to know why I can't connect externally. Tell me what to do, and I can handle it from there. It appears you are clueless in trying to troubleshoot this yourself. So take Carlo's offer in having a Teamviewer session and he can sort it out quickly. Addresses outside of these ranges would be public (internet) addresses. 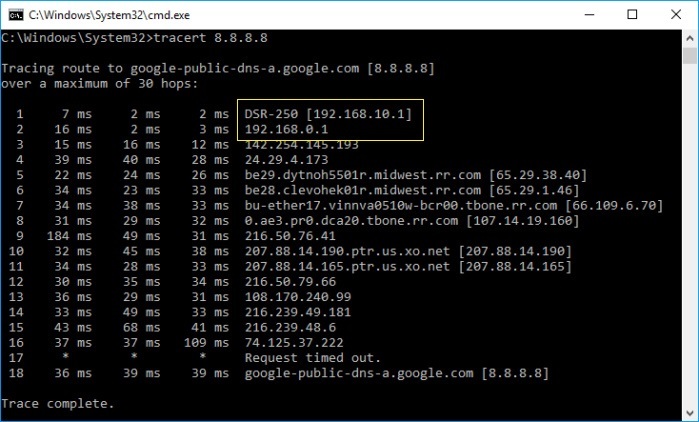 Open a Command Prompt (on Windows, click on the Start menu, type “cmd,” and hit Enter) and type “tracert 8.8.8.8“ to see the traceroute to Google’s DNS server. If you see two private IP addresses listed in the first two hops then you have double NAT. If you see only one private address and the second hop shows a public address, then you’re all good. So try running this and let us know if the first two hops are private or not.